Today I welcome Sandra Antonelli to my blog – Sandra writes “Quirky Romance Novels for Grown Ups…and Smart Asses”. Welcome Sandra – it’s great to have you here. So tell us, please. Do you have a passion other than writing? Thank you so very much for having me here to talk about one of my greatest passions, Kerrie. I adore movies. I love, love LOVE going to the movies and I love watching movies at home. I can’t do algebra but I can tell you who was in a movie, when it was made, and other the films the actors have been in. It’s wonderfully useless trivia, but it does come in handy for winning trivia contests. Another movie aficionado! It seems to be a common thread with writers! How long have you been a movie lover? My love of cinema has been lifelong. The first movie I can recall watching was Ben Hur and then The Ten Commandments. This resulted in my thinking that Charlton Heston was in every movie ever made. The first film I remember seeing in a cinema was The Wizard of Oz. The Wicked Witch of the West scared the living doody out of me, but the flying monkeys did my head in, so that when my dad took me to see Planet of the Apes, with Charlton Heston, I was totally confused because there were good and bad monkeys. Hehe, I can see why you were confused! What is it about movies that bring a sparkle to your eye? I’m a visual reader. As I read, I see things on a movie screen in my head. I write that way too. Maybe that is why I love the medium of film storytelling. The nature of a story on a big screen is mesmerizing and I am impressed when a director’s imagination is transferred to live moving images. It’s sort of like seeing inside someone else’s head. When I was 12 and moved to the USA, I would get dropped off at the shopping centre or the multiplex cinema to see a movie. When that movie was over, I’d walk into the theatre next door, where another movie was just starting. I’d spend the entire day at the movies. Sometimes I’d see the same movie 3 times in a row, or 3 different movies. I saw great films like Raiders of the Lost Ark, and crapfests like Ice Pirates. There were times I’d be the only person in the theatre. It would be me and a 10 foot tall Mel Gibson and Danny Glover, which you know I’d act out along with Gibson & Glover. I bet you really want to know the dialogue from Lethal Weapon by heart, like I do, don’t you? A 10 foot Mel Gibson! I’ll ask you for a re-enactment at the next conference! Can you share a photo of you indulging in your passion? Sadly, flash photography is frowned upon in the cinema. 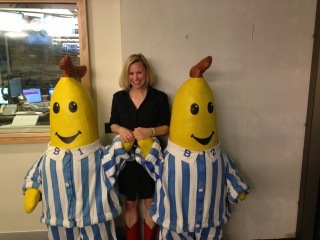 Here is a photo of me with Screen legends B1 and B2, The Bananas in Pyjamas. Finally, please tell us a little about yourself. I have deep abiding love for coffee, rat terriers, peanut butter, and cookies. I am a strong advocate for Eating Breakfast, the most important meal of the day. I come from the land Down Under, but I don’t eat Vegemite and I don’t drink beer. I drive a little Italian car, live in a little house with a little, peanut butter-loving dog who thinks I’m his wife. I am married to a big, bearded Sicilian, who is the moon and stars above my head and earth beneath my feet. I write smart-assed romance fiction for grownups and smartasses. My latest release is Driving in Neutral, a love story about a smartass with claustrophobia. You can find it here. And I was so sure this post would be all about coffee! Thanks Kerrie & Sandra. Thanks for dropping by, Lily. Sandra obviously has a reputation as a serious coffee drinker! Thanks for the comment, Susanne. Sandra must really love her coffee! Aw, you look so cute with the bananas in their pyjamas. She does, doesn’t she?! I’m not sure who is cuter – the bananas or Sandra 🙂 Thanks for dropping by, Rhyll!